In January 1969, Paul McCartney, who played the piano, along with John Lennon on bass, George Harrison and Ringo Starr recorded The Long and Winding Road. Unusually, it was produced by Phil Spector and not George Martin. It was a long time after the Beatles recorded the sad song at Abbey Road that it finally entered the top 100 in the United States in April 1970. The song won an Academy Award and was later covered by Ray Charles. In 2013, the remastered naked version of the song was released. But for bloggers, the following words are worth considering. Be patient; you need to wait because it takes time to succeed. Perhaps you would like to listen to the song while you read on. Why does it take so long for people to visit a new blog? If you are a new blog or website owner, you have checked your traffic stats with Google Analytics and other SEO tools. In the first few months, your web traffic data might look something like the image below. The site traffic data above is for a new blog I started about six months ago. The weekly stats for search traffic are very low, and the bounce rate is extremely high. The new site, AtlasLit is my fourth blog, and it is following the same pattern as my established blogs. All of them started slowly and took a long time to attract a steady volume of search results from search engines. For one of my established blogs, you can see how the progression builds once a website ranks on Google and Bing search. But the improvement is not linear. The main reason it takes a long time to establish a new blog is that there are a lot of blogs and websites all competing for an audience that is not growing at anywhere near the same rate. 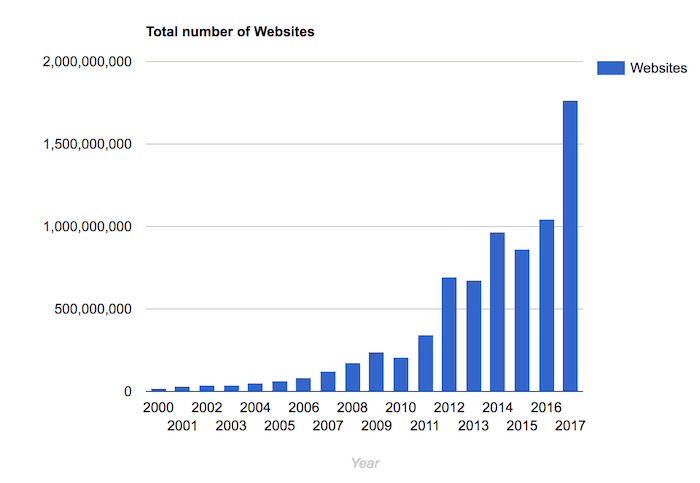 To give you some perspective, take a look at the growth in websites over the years. Most of the websites above are blogs or sites that are publishing articles and content. The growth can perhaps be explained by the shift away from social media marketing to content marketing in the last couple of years. Content marketing or organic marketing uses an article or blog post as an advertising page for products and services. Posts are written to attract targeted traffic by employing a range of search engine optimization (SEO) techniques. 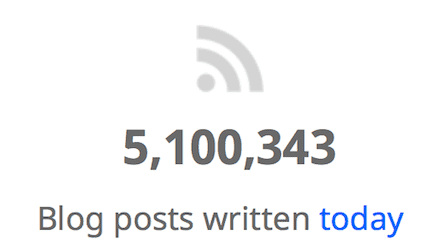 It is growing at a rapid rate, and along with posts from everyday bloggers, a massive number of blog posts are published every day as the image below shows. 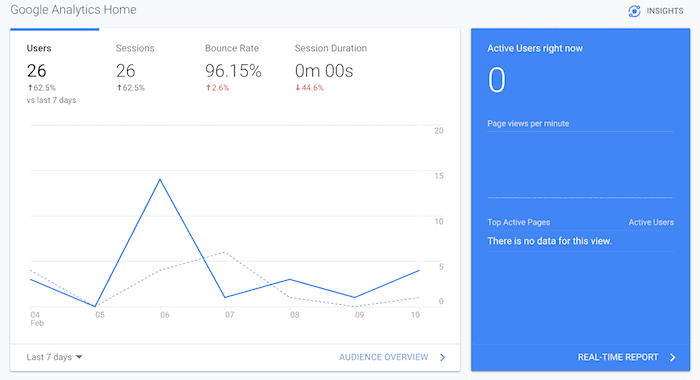 The statistics above from Internet Live Stats give you some perspective of where one new blog post on your site fits into today’s world on the Internet. But it is not all gloom and doom. There are proven ways you can rise above the crowd and encourage search engine indexing to become your primary traffic source. All you need to do is understand how to rank. If you are new to blogging, it is essential to know that many factors have a positive effect on your blog’s monthly search results. All of them take a long time to start working, unfortunately. But when they do finally start to kick in, expect a big jump in your web traffic. Google has around 200 ranking factors that it uses to rank web pages, but you don’t need to dig that deep. If your site or blog is loading quickly, is mobile-friendly and looks appealing, there are only five key factors that you need to concentrate on to improve your website traffic from search engines. The following Google patent quote has appeared many times on SEO sites. While it is not written in stone, paying ahead is good practice for your new blog or site. The annual fee for your domain name is probably less than $10.00. So paying two or three years in advance is a quick and easy way to give your new site some SEO legitimacy, and it can only have a positive effect on your site’s ranking. Without content, you go nowhere in blogging. You need to publish a lot of well-written, informative and long-form articles on your site. According to Backlinko, more extended content tends to rank higher in Google’s search results. The average Google first page result contains 1,890 words. No matter what your blog topic, you should avoid short blog posts, and stay within the range of 1,000 to 2,500 words. Most articles that rise to the top of search rankings are answering questions or providing solutions for people. If you keep in mind that people often type a form of a question into Google or Bing search, then you can write your articles accordingly. Also, make sure that your writing is grammatically perfect and free of spelling errors and typos. You can use the free version of Grammarly to help you with this. You need to publish at least 30-50 articles before you start to see and traction with search engines. Yes, it is a long road. But keep in mind that your articles will keep working for you for years to come, so think of them as an investment. Another content tip is to update your articles. It is another Google ranking factor if you add more content. Go back to some of your existing articles and see if you improve them by expanding the article and adding new images. You are probably already adding external links to your blog posts. It is a very good practice because you can validate your article with quality sources. It is also a ranking factor as search engines can see that you are linking to high-quality sites. But an equally important ranking factor is internal linking. By adding links between your articles, you are telling search engines how your content is connected. It builds a hierarchy of the information you are writing about. In a 1,500 word article, you should add around three internal links to your other posts. By adding internal links, you will increase your pages per visit. Add one early in the article for readers who may not be so interested in your article, but may be interested in something else. Add another in the middle, and one at the end. The one at the end is very important because it encourages a reader who likes what you are writing about to want to read more. Another golden rule with links is that you should always open external links in a new tab. By doing so, your reader still has your article open in its existing tab. For internal links, always open in the same tab. This makes sure your reader stays on your site. SEO keywords are the heart an soul of gaining search engine traffic and more unique visitors to your blog. The whole Internet is driven by search keywords. There are many ways you can research keywords for free, or if you are determined to take a faster track, there are premium keyword research tools available for pro bloggers. A key point to understand is that one blog post can earn many keywords from search engines. It is not unusual for one post to be indexed under 200 or more keywords. That means that people have over 200 ways to find your post. To save me writing a long how-to guide for organic keywords in this post, the best idea would be to read some earlier articles that delve deep into how to do your keyword research and how Google and Bing assign keywords to articles. How Many Google Keywords Can Rank In One Blog Post? The key factor in writing around keywords is to understand how people search. Finding the right search terms that people use and including them in your text is the most proven way to achieve success for blog posts and articles. The top factor for search engine ranking is by far the hardest. It is also the main reason why it takes so long for a new blog to gain traction. It is the number of backlinks you have earned from other blogs and websites that add a link back to your site or one of your articles. 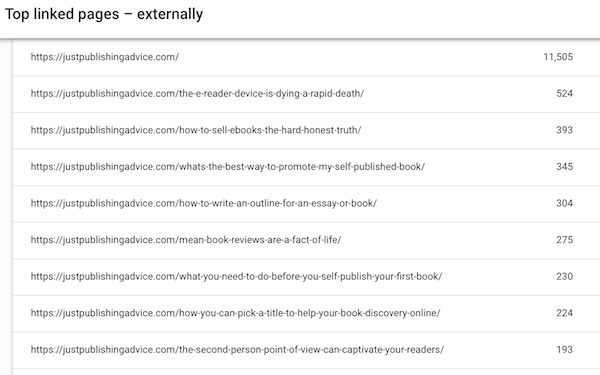 Here is an example of some of the ranking pages on Just Publishing Advice from data on Google Console. Until you can earn backlinks, your pages will struggle to rank. That is why my new blog has yet to get off the ground. But it is the same for an existing blog that is doing well. New articles take a long time to rank and it is mostly the older articles that produce the most traffic. As a rule of thumb, posts over one-year-old usually bring in the bulk of the search traffic. There are many ways of trying to gain backlinks. For some years, it was considered good SEO practice to send emails to a list of other blogs when you published a new article, and ask for a backlink. Unfortunately, this practice has become so popular that it is now bordering on spamming. I get at least 20-25 of these emails every day, and they head straight for my junk folder. A better way is to get to know some bloggers in your topic area and from time to time, exchange, swap or add links to each other’s articles. But don’t overdo it. 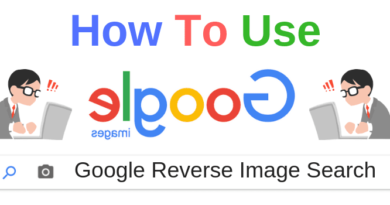 If you swap 100 links with one site and yours in a short period of time, it will raise alarm bells with Google algorithms, and you will lose, not gain ranking. A little goes a long way, so it is best to spread your exchange linking to only one or two per external site. But in reality, the best way to gain backlinks is to earn them organically. When bloggers add backlinks to an external site, they do so to prove a point, add a statistic, validate a theory or to add value to their article for their readers. If you can write articles that fulfil these needs, then you will get backlinks over time. It then starts to work like the snowball effect. Every new backlink you get will help you get more referral traffic, which will lead to getting more links, which will lead to more referral traffic. That is why I say it is a long road to success with a new blog. But once the snowball starts, you are on your way. Every successful blog started from zero, so you are no different from the big names in blogging. All you need is patience and determination to see you through the tough early period. As long as you keep adding new quality articles regularly, work on keywords and your internal linking and keep updating your existing posts, readers and search engines will start to notice. It might be slow, but it all works in the long run.